The existing 956 sq ft lake house was functional, but by no means practical, when two new families partnered to purchase this vacation property as a weekend retreat and family gathering place. 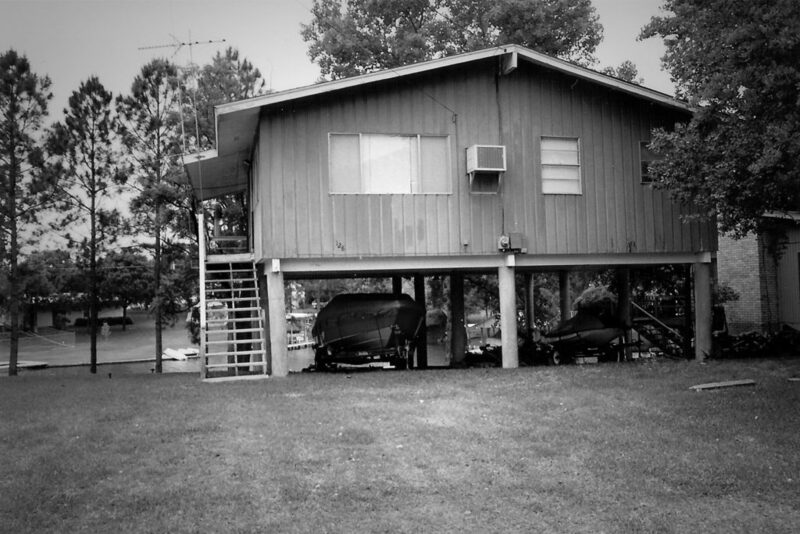 The existing floor plan built on stilts included two miniature bedrooms, an undersized kitchen, and one bathroom. For two families, that could have on any given weekend twelve family members and guests come to visit, this layout lacked much needed sleeping and entertaining areas. By taking advantage of a previously undeveloped 1001 sq ft of area under the building footprint, as well as closing in an existing 244 sq ft deck on the second level, 1245 sq ft was added. More than doubling the size of this home, while only adding minimal area to the impervious cover of the lot, helped gain the much needed space requirements and left room to upgrade the existing septic system and add a driveway to get visitors cars out of the narrow right of way. One of the client’s major issues with the existing floor plan was the single restroom. With up to twelve guests visiting at a time, the two and half baths in the new layout allow their occupants to use the potty room, tub/shower room, and vanity/dressing rooms all separately without blocking access to other guests. Coming from a space that previously had indoor/outdoor carpeting, tangerine Formica countertops, dark wood paneling and window a/c units, the newly updated kitchen and living areas really shine. With stained wide plank pine upstairs and stained concrete flooring downstairs, rich mocha travertine and honed granite countertops in the bathrooms and kitchen, and central HVAC system, the upgrades are endless. The new kitchen is a chef’s dream, which includes a modern 48” KitchenAid drop-in range top, custom wood surround range hood, wood chopping block island top, and custom spice rack pullouts. To seat the large crowds, a built-in breakfast nook saves space and allows the family to come together for meals and game time under a row of double hung windows that blurs the indoors with the outdoors. A split-level entry porch, bunk room with custom built-in single over queen bunk beds, game room with kitchenette, second full bathroom, half bath and single-car garage are among the many added features that came with closing in the lower level on this now two-story home. The final touch on this complete remodel is the lakeside connection. Placed in a small cove off the main body of water, the existing boat dock and deck were surrounded by moss and mud-filled water. By building a retaining wall extending into the water and backfilling it with sand, a small sandy beach and play area were created. 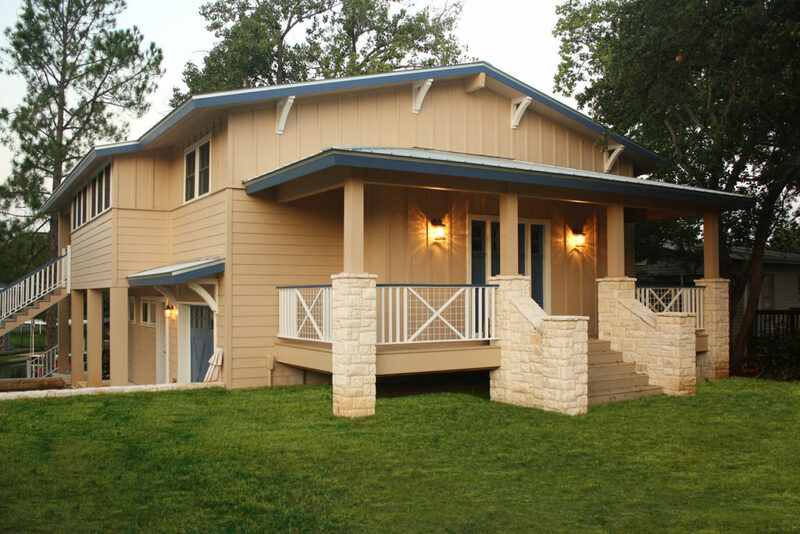 Two oversized decks with views of the lake, an outdoor stone fireplace, and flagstone walkways that stair step down to the water complete this beautiful remodel on Lake LBJ.